The agriculture sector is the backbone of an economy which provides the basic ingredients to mankind and now raw material for industrialisation. Agriculture provides employment opportunities for rural people on a large scale. “Increase in agricultural production and the rise in the per-capita income of the rural community, together with the industrialisation and urbanisation, lead to an increased demand in industrial production.” In this way, agricultural sector helps promote economic growth by securing as a supplement to industrial sector. Agrarian distress has begun after reforms started in 1991, when focus shifted to the manufacturing and service sectors, which grew much faster. It was only a decade later that some reforms were undertaken in the sector. Liberalising the milk order, and permitting futures trading in commodities is a good sign for agriculture reforms. National Agriculture Market (NAM) is a pan-India electronic trading portal which networks the existing APMC Mandis to create a unified national market for agricultural commodities. NAM is a win-win solution for all the stakeholders that is Farmers, Traders, Buyers, and Processers & Exporters in Supply Chain. NAM is a network for connecting formers and traders. Agriculture Sector is a crucial for human energy. It is the main Input to the biotic for any activity in the planet. Currently the level of agriculture production and overall availability of foodgrains is satisfactory. Food grains Stock in Central Pool for current period October – 2017 is 369.63 (Fig.in lakh MT)Agriculture is a state subject. Centrally Sponsored and Central Sector Schemes are being implemented for enhancement of agricultural productivity and production for livelihood to the people of India. Agriculture is the principal source of livelihood for more than 58% of the population of this country. Agriculture provides the bulk of wage goods required by non-agriculture sectors and most of the raw materials for the industries sector. The combined efforts of Central Government, State Governments and the farming community have succeeded in achieving record production of 244.78 million tonnes of food grains during 2010-11 and India’s food grain production increases marginally to 252.23 million tonnes in 2015-16 crop year. This record production has been achieved through effective transfer of latest crop production technologies to farmers under various crop development schemes being implemented by the Department of Agriculture & Cooperation backed by remunerative prices for various crops through enhanced minimum support prices. The Government targets record 270.1 million tonnes of foodgrain production in 2016-17During the 12th Five Year Plan, Ministry Of Agriculture will focus on sustaining the current momentum by stabilizing food grain production to ensure food security. For sustaining higher levels of production, it is necessary to target new areas of foodgrain production, while promoting conservation agriculture in the high production areas, to maintain current levels of productivity. New technologies are needed to break yield barriers, utilize inputs more efficiently and diversify to more sustainable and higher value cropping patterns. Water to every field” will be achieved. Improved irrigation facilities with long term irrigation fund and better management . by next year about 14 crore farmers will get Soil Health Card and significant numbers will get the insurance cover. to set up 150 seed hubs in country to increase production of pulses. Each hub produces 1000 quintal of quality seeds which will be provide to farmers. Enhancing farm level economy (i.e. farm profits) to restore confidence amongst the farmers. To improve the quality of life of farmers’ especially small and marginal farmers by offering a complete package of activities to maximize farm returns for enhancing food and livelihood security. National Agricultural Insurance Scheme (NAIS) like Pmfby (Pradhan Mantri Fasal Bima Yojana) is scheme for protecting financial loss due to crop failure. The scheme would cover all farmers. The Scheme is in line with One Nation – One Scheme theme. It incorporates the best features of all previous schemes and at the same time, all previous shortcomings/weaknesses have been removed. Strengthening / Promoting Agricultural Information System: To promote e-Governance in Agriculture at the Centre and to provide support to States/UTs. Focus on low productivity and high potential districts including cultivation of food grain crops in rain fed areas. Agro-climatic zone wise planning and cluster approach for crop productivity enhancement. i. Focus on low productivity and high potential districts including cultivation of food grain crops in rain fed areas. ii. Implementation of cropping system centric interventions in a Mission mode approach through active engagement of all the stakeholders at various levels. iii. Agro-climatic zone wise planning and cluster approach for crop productivity enhancement. iv. Focus on pulse production through utilization of rice fallow, rice bunds and intercropping of pulses with coarse cereals, oilseeds and commercial crops (sugarcane, cotton, jute). v. Promotion and extension of improved technologies i.e., seed, integrated nutrient management (INM) including micronutrients, soil amendments, integrated pest management (IPM), input use efficiency and resource conservation technologies along with capacity building of the farmers/extension functionaries. vi. Close monitoring of flow of funds to ensure timely reach of interventions to the target beneficiaries. vii. Integration of various proposed interventions and targets with the district plan of each identified district. viii. Constant monitoring and concurrent evaluation by the implementing agencies for assessing the impact of the interventions for a result oriented approach. Before the harvest during each Rabi / Kharif Crop season, the Government of India announces the minimum support prices (MSP) for procurement on the basis of the recommendation of the Commission of Agricultural Costs and Prices (CACP) which along with other factors, takes into consideration the cost of various agricultural inputs and the reasonable margin for the farmers for their produce. Agriculture Sector is a crucial for human energy. It is the main Input to the biotic for any activity in the planet. Few scientists think of agriculture as the chief or the model science. Agriculture is the mother of all sciences; it remains the science which makes human life possible. Agriculture extension services constitute another key input which can improve productivity in agriculture by providing timely advisory services to farmers to adopt best practices, technology, meet with contingencies, market information etc. The Scheme of Mega Food Park aims at providing a mechanism to link agricultural production to the market by bringing together farmers, processors and retailers so as to ensure maximizing value addition, minimizing wastages, increasing farmers’ income and creating employment opportunities particularly in rural sector. The Mega Food Park Scheme is based on “Cluster” approach and envisages a well-defined agri/ horticultural-processing zone containing state-of-the art processing facilities with support infrastructure and well-established supply chain. Agriculture productivity has increased significantly with better use of fertilizer, pesticide and technological interventions. The net area under irrigation has increased from 38.72 million hectares in the year 1980 to 65.3 million hectares in 2014. Various initiatives taken by the Central and State Governments have increased the farmers’ access to farm insurance, farm credit, quality inputs and markets to sell their produce and increasing in export of agricultural products. Pradhan Mantri Fasal Bima Yojana (PMFBY) is scheme for protecting financial loss due to crop failure. The scheme would cover all farmers. The Scheme is in line with One Nation – One Scheme theme. It incorporates the best features of all previous schemes and at the same time, all previous shortcomings/weaknesses have been removed. The scheme will be implemented by the Department of Agriculture and Cooperation (DAC), the relevant state government, and various agencies such as commercial banks, cooperative banks, regional rural banks, etc. (iv) Localised calamities (such as hailstorm, inundation, etc.). Yield losses and prevented sowing will be insured at the village level. 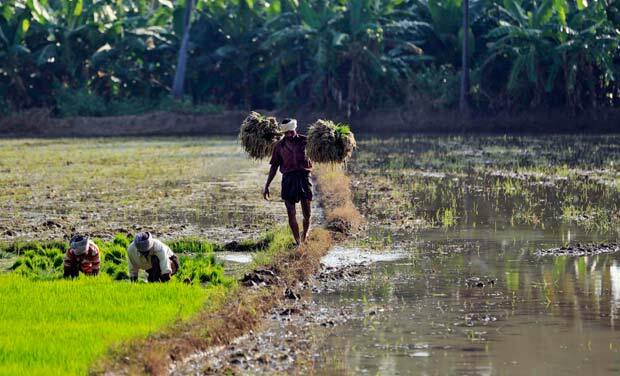 Post-harvest losses and localised calamities will be covered at an individual farm basis. The scheme will not cover losses due to war, nuclear risks, theft, domestic or wild animals, and preventable post-harvest risks. Indian farmers needs to be both innovative and competitive in the global market. It is the task of government, policy-makers, educators, researchers, and extension workers to ensure they have the tools, technologies, and new farming systems that enable them to be so. The approach should be participatory, involving farmers, researchers, the market, and the political level. Training new generation agricultural scientists will take time, commitment, and resources from the government, universities, and the agricultural industries. Urgent measures are needed to attract bright students into agricultural, food, and natural resource science areas. A reorientation in the mindset of teachers and agricultural graduates can be brought about only by innovative changes in curricula and courses in Indian agricultural universities. It will accelerate development and adoption of improved agricultural practices and technologies to meet future constraints imposed by climate changes, population pressure, and increased food and feed demand. The expected outcome is improved productivity and the sustainable use of agricultural lands by developing a more diverse farming system, supporting economic development in India.